The orchard is open to the public for special events such as Apple Day in October and Wassail in January. We also take part in community events and festivals in the Bristol area. Details of events are announced here as dates are set, so check back regularly to keep up to date with our activities. Celebrate Apple Day & our 20th year! Puzzled by fruit tree pruning, pests, or diseases? 2pm - Mulch "sheets & bagels"
now planted and happily toddling along at 18 months old. Be inspired to grow more fruit in small spaces. 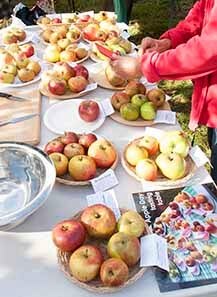 Don't miss the much-loved apple tasting table, featuring more than two-dozen different varieties to try, including rare, local, and distinctive fruits, not usually found in the shops. Juice making is an energetic and family-friendly activity. Fresh-pressed juice tastes much more interesting than commercial juice, and brings even greater pleasure when accompanied by a slice of lovely home-made cake from the refreshments stall. Find out more about the exciting Orchard Learning 2018, a 12-month, orchard-based practical learning programme, that begins Februrary 2018, and marks the 20th anniversary of HOCO. Enjoy an afternoon exploring Bristol’s pioneering community orchard. Come and see our newly planted Home Orchard Plot project – a mini orchard with a 10 x 4 metre footprint. Be inspired to grow productive and delicious fruit on your allotment or garden. See our Orchard Roots Bristol exhibition for stories of local and heritage apples. Find out how a small community group transformed a piece of marginal and neglected land into a beautiful, fruitful urban oasis. · The relaxed nature of this event gives us time to answer your fruit growing questions. · Homemade cakes, refreshments, produce and plants for sale. · Compost loo on site. · Join the orchard in June and share in this year’s harvest! Metford Road Community Orchard, which is open 12-5pm. Entrance next to 37 Metford Road, BS6 7LA. Double your orchard pleasure on June 17 and visit this secret, organic orchard planted on permaculture principles. It’s on a steep slope, sturdy shoes advised. Enjoy thriving wildlife, guided tours, and refreshments. Produce and plants for sale. Compost loo on site. Our 2017 Wassail will take place at the orchard on Saturday 14th January from 2pm till 4pm. Come along and sing and drink the health of our trees! They'll be apple juice and cakes for sale, and Pigsty Morris will be entertaining us again. Don't miss it!